Spring is officially in the air, though some of us are still feeling the wrath of Old Man Winter – sorry about your luck, folks! 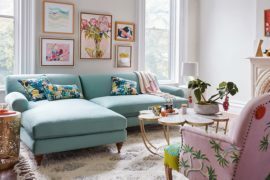 Let’s all pretend that the weather is beautiful and the birds are chirping – because after they see this project, they just might start! 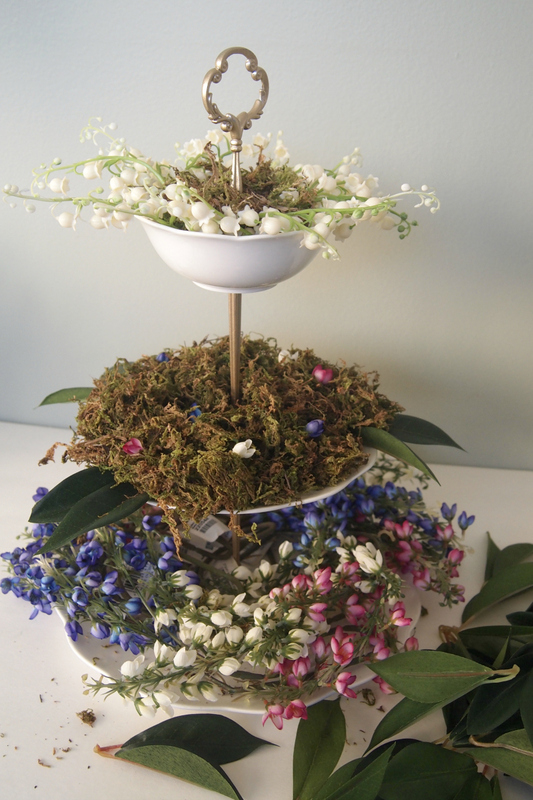 With Easter literally just around the corner, this might be a great last minute option for those of you who love the look of fresh flowers, but maybe don’t have time to stop at the florist in between manic trips to the grocery store! 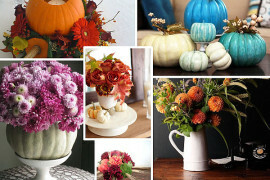 This is pretty easy to do, and you can totally get creative using different types of flowers, too. 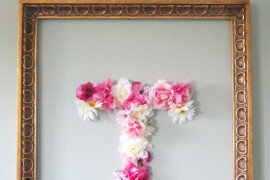 Make all of your faux blooms substantially smaller! 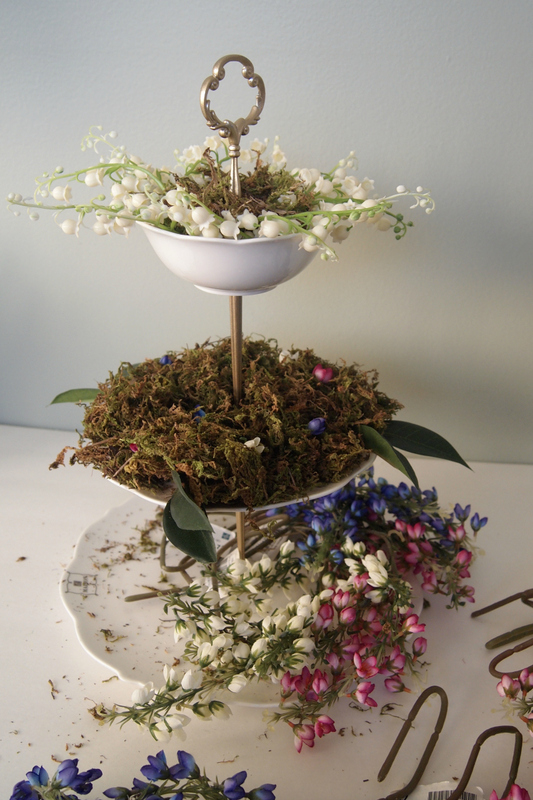 For the leaves, I simply picked them off of the branches, and the lily of the valley came off in much the same way – don’t worry, you can totally put them back after you finish with the centerpiece. 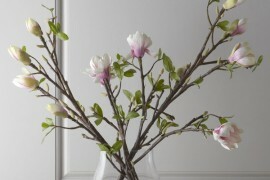 For the fuller blooms, I kept the branches long and folded them up tightly – this way you can also use them again! The little buds I removed randomly to use along one of the layers. 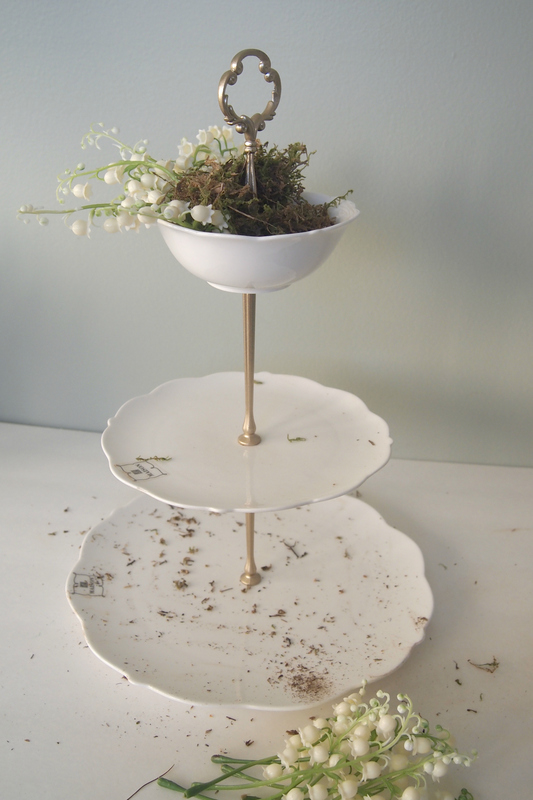 Get your cake stand ready and start at the top (that way you can clean up the messier parts as you go along). 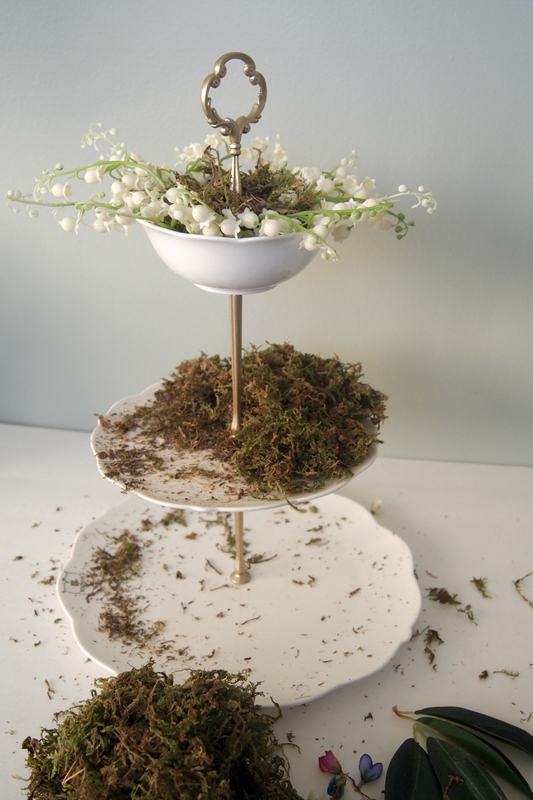 Just add a bit of moss to the top tier – easy peasy! 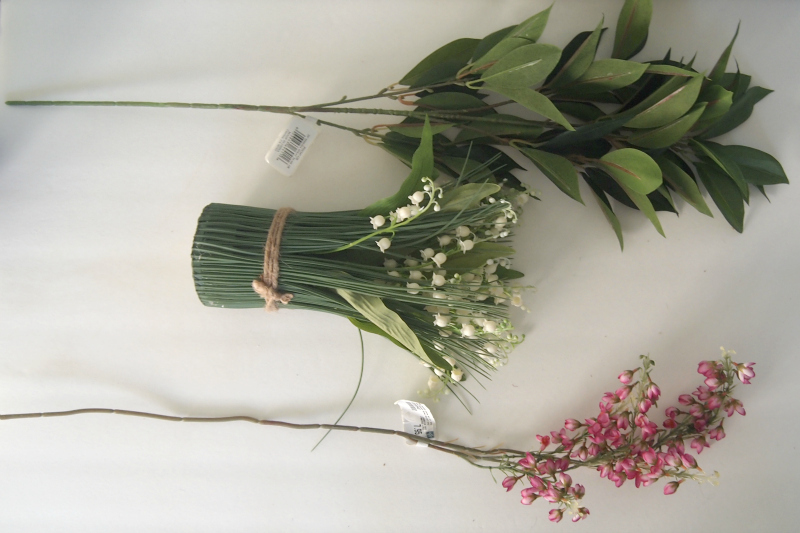 Now go ahead and add the smallest flowers – lily of the valley in my case. Just casually tuck them into the moss as you go. Now you get started on the middle level. Just loosely place some moss on the stand and make sure it doesn’t come too far off of the edge. This WILL be messy! 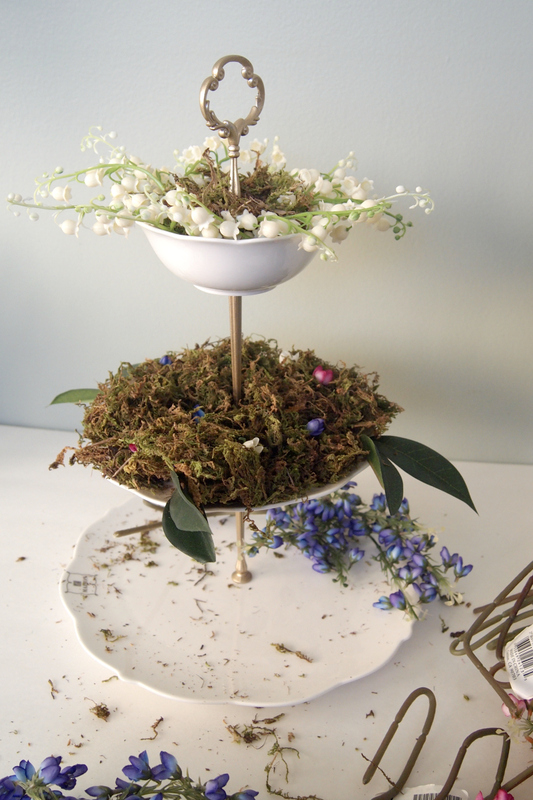 As you finish the moss, add in some of those loose buds for a bit of colour, and to really bring in the feel of a budding spring to the piece. Feel free to add in some leaves as well! Now this is the no-mess bit. 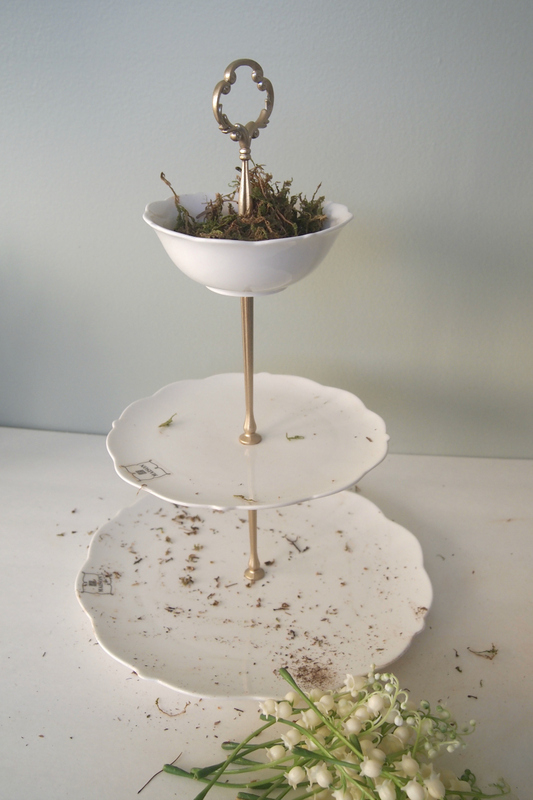 Take those longer branches that have the bottoms all twisted and start placing them on the bottom plate. 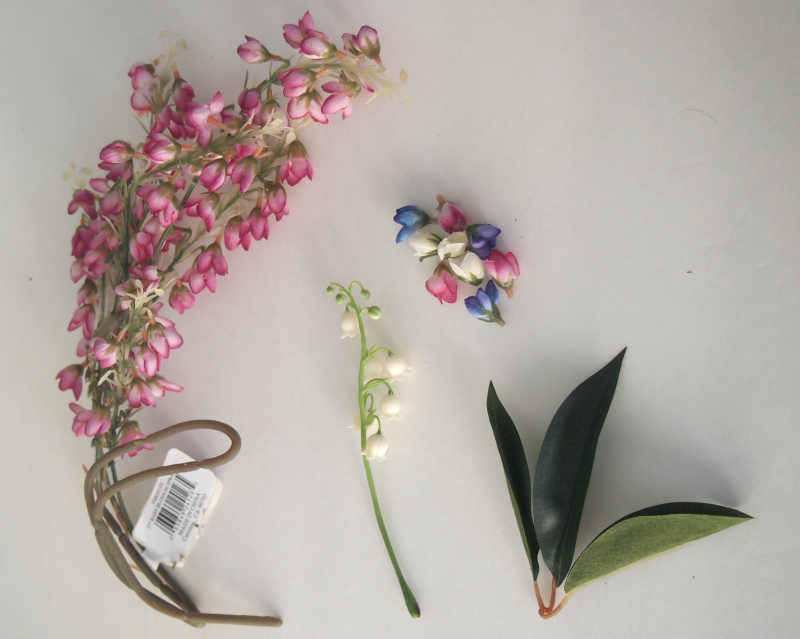 Layer them, covering the branches as you go along with new blooms, and alternating colours as you go. I used two pink, two purple, and two white ones. 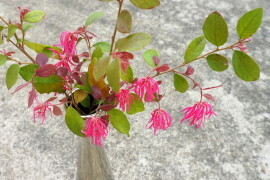 Keep chugging along, and once all blooms are in place, you’re almost finished! 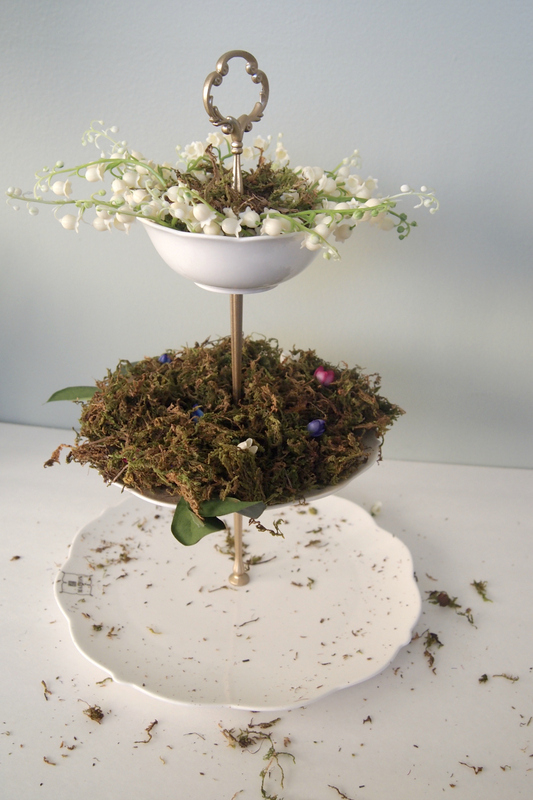 Now start adding in some of those loose leaves to the bare parts, or anywhere with visible branches. This will really help to fill in your arrangement! And just like that, you’re all done! 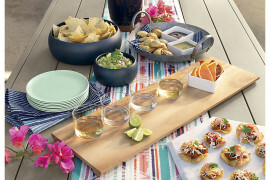 Now go ahead and set your table with all of your best and prettiest dishes and watch your new centerpiece steal the show! 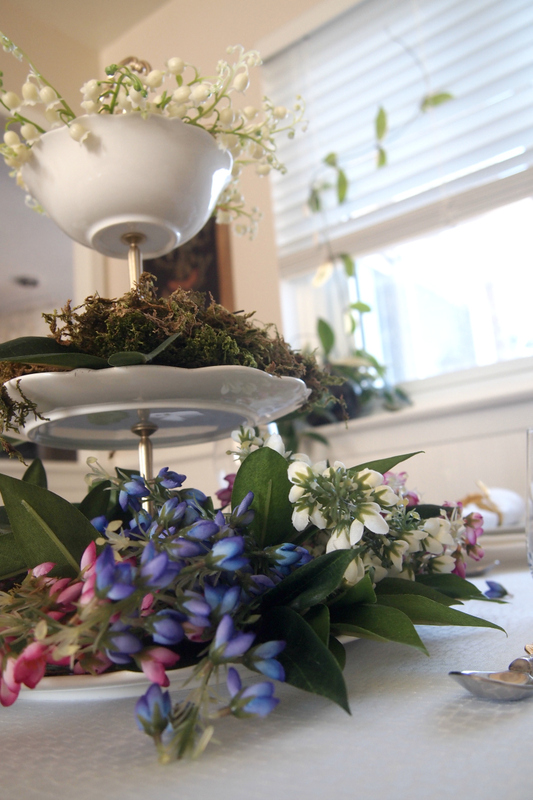 Needless to say, you don’t need very much around this beauty, and it can easily be used for several occasions. 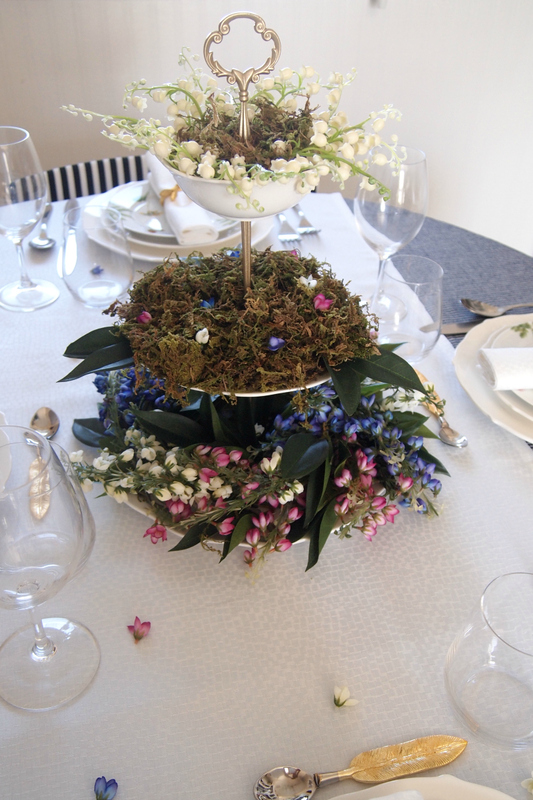 I also used some of the loose blooms around the table for the extra touch of spring. Plus, it’s just downright pretty, am I right? 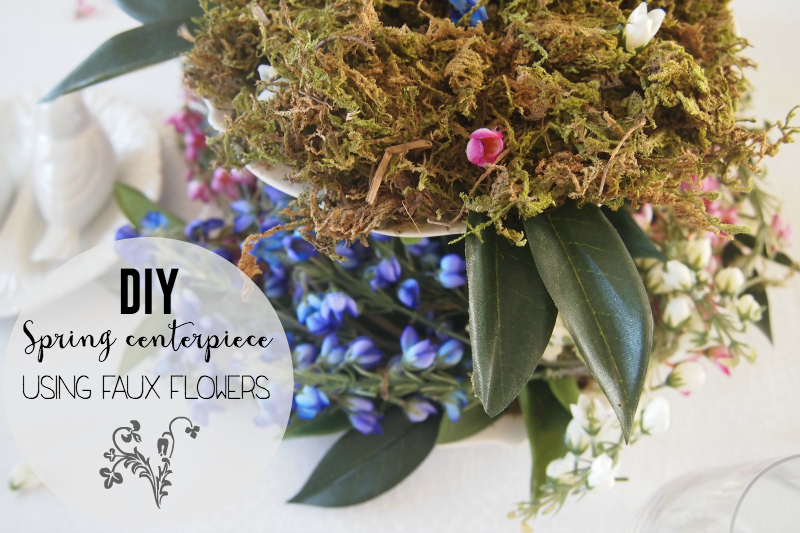 So will you be trying a faux flower spring centerpiece? 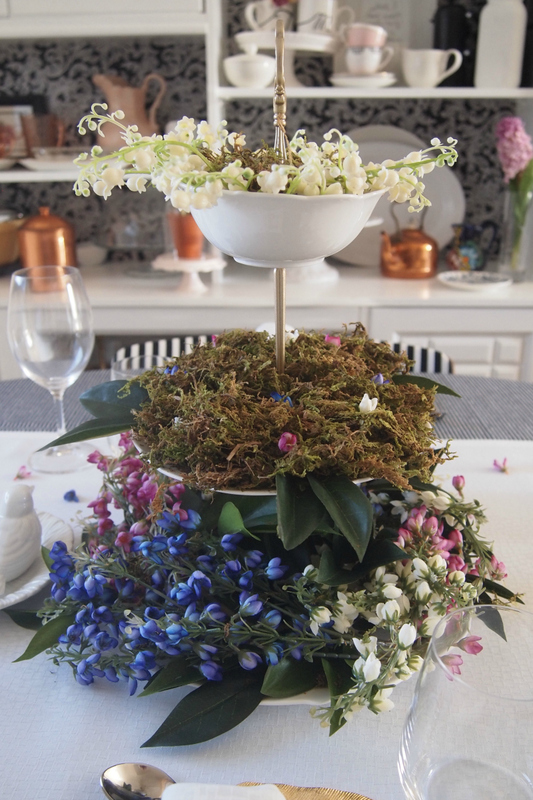 Did this maybe, just maybe save you from having to run out to the florist this weekend? I sure hope so!